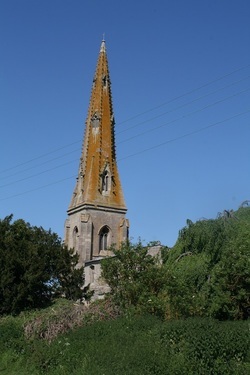 In 2011 St.Nicholas Church in Walcot was targeted by a gang of Lithuanian thieves who stole approximately three tonnes of lead from the lower roof. Considered Britain's most prolific church lead theft gang, they were jailed in 2012 for a total of more than two decades. They were found guilty of lead theft from 20 churches across Lincolnshire, Leicestershire and Nottinghamshire. After insurance claims and grants, this has left the small village of Walcot (approximately 18 houses) short of £10,000​​ to get the roof repaired. This website was set up then to raise awareness of the historical importance of St Nicholas Church and to promote fundraising efforts to help repair the roof and maintain this significant landmark for future generations. Planning permission was granted in July 2013 and work was finished to repair the lower roof. Sadly, in August 2016, Walcot was targeted again and more lead was stolen from the upper roof of the church. Other local churches including Lenton, Newton and Kirkby La Thorpe also had lead stolen. Unfortunately, this meant more repairs and more cost for all of these small Lincolnshire villages. Repairs to St Nicholas were completed in October 2018 but fundraising continues to pay for it all! Please save up your adult and children's second hand clothes, shoes & handbags. (no duvets, bric-a-brac or curtains please). Leave in the garage at The Grange, Walcot. We receive £400 per tonne collected. and join us for a FREE trial! Click HERE to view all the parish services, diary of upcoming events in the Parish and regular events.